About 12.000 years ago sea level was more 60m lower than today and large parts of the North Sea were dry land. In the following 4.000 years sea level rose more than 40m and the North Sea was formed. This story currently lies buried below the present sea floor and is not only of interest for geological and archaeological studies, but also for improving our projections of future sea-level changes. 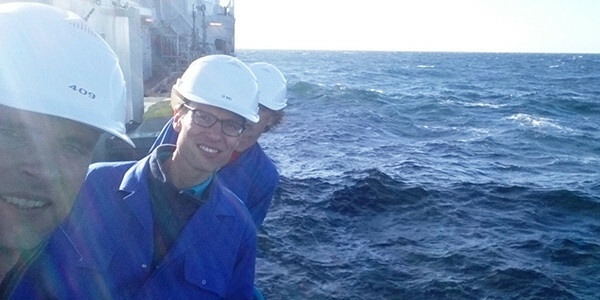 Marc Hijma, Chris Mesdag (both Deltares) and Freek Busschers (TNO-Geological Survey of The Netherlands) were on board the NIOZ research vessel RV Pelagia between June 16-23 to sample peat layers that mark the transition from dry to flooded land. Using seismic data and information of existing cores they will select the best sites to drill into the seafloor using a vibrocore. This research has been done in cooperation with NIOZ, the universities of Utrecht (Kim Cohen) and Leeds (Natasha Barlow) and the Rijksdienst voor het Cultureel Erfgoed (RCE). You can read the findings of Hijma and Busschers in this blogpost. Today we had a great day with good conditions. We started doing seismics in a small area northwest of Vlieland. Our Sparker and Chirp seismics gave us stunning details in occurrence of the Early Holocene Basal peat just below the current seafloor and let us determine two locations for drilling. After a first test in which the core got stuck in glacial till, we managed to collect a total of six cores of 2.5 to 3.8m with an up-to one meter thick layer of sphagnum peat. Han Doman and Tanya Lippmann were able to collect samples of methane by drilling holes in the PVC liner, taping them and extracting the gas directly after hoisting of the core. All in all a great start of our expedition. Special thanks to Gert-Jan Reichart and Sytze van Heteren for initiating this project! While sleeping, the Pelagia brought us far north, in an area called the Oyster Grounds. It is our farthest point and with water depths of around 50m also our deepest. Old boreholes gave us indications that we could find peat here. After seismic reconnaissance we selected some sites, but of course nature surprised us. What we found was a sediment type called gyttja, that in this case consisted of organic matter, clay and very fine sand`. Gyttja accumulates in standing water bodies like lakes, residual channels or lagoons. The clay layer on top of the gyttja looked tidally influenced. So what did this tell us? Our first thought is that the gyttja formed in fresh water and that the transition to the clay marks the flooding of the area due to sea-level rise. If true, this would be one of the oldest sea-level indicators from the North Sea and hence we are quite excited! With old we mean in this case somewhere around 12.000-11.000 years…So partying tonight? No, sitting in a container watching seismic data coming in until 11pm. But hey, we live for this kind of work. The earliest drowning of the North Sea was revealed today in stunning detail, pulling us back 10.000 years in time. Pelagia’s formidable crew obtained three exceptional cores from below the North Sea floor at water depths of 45m. The base of the cores showed last ice age dry land sands overlain by a 15cm thick peat layer. The peat is the first evidence that the area started to drown and changed into a swamp with reed and trees. Perhaps animals visited the area, or even humans, things we better will have to examine in the future. On top of the peat sediments occur that were deposited very close to a former coastline. This is shown by marine mollusks and sands with clay layers, indicating that the tides were already affecting the area at this time. Finding 10.000 year old evidence for tides at these depths is unique in this part of the world and a real boost for us to continue collecting data from below the current sea-floor. But time is really flying when you are having fun, only three more days to go! It is time to go back to Texel. With us we take about 200 1m sections of sediment, gigabytes of seismic data and a bag full of increased insight. The last few days were intense. It feels like weeks ago, but during the first part of the cruise it was relatively easy to find peat. But immediately after we went back to shallower water, still about 30 m deep, it became very hard to find peat. It was there once, but it has been eroded by waves and tidal channels. Last night we therefore decided to make a radical change to our original plans and move 50 km southward. And jackpot! In the last core of the cruise the vibrocore brought up a very nice peat below marine sand. Just another piece that will help us solve the puzzle of early Holocene sea-level changes, in understanding the relation between climate, ice sheets and sea level and hence also in improving our predictions of future sea-level changes. This was how we went back and forth to the captain: new coordinates, new plans, new ideas.